The lights will be on every night of the festival. DUBLIN’S LIBERTY HALL will be shining bright over the next week to show support for Ireland’s LGBT community. SIPTU are illuminating the rooftop of Liberty Hall in rainbow coloured lights to celebrate Dublin’s Pride Festival. The rainbow colours have been a symbol of LGBT pride and solidarity since the 1970s. The union says the action is “a demonstration of solidarity with the Lesbian, Gay, Bisexual and Transgender (LGBT) community”. The lights will be switched on at 11:00pm tomorrow night. They will then be on every night during the Pride Festival from 10.00pm to 7.00am until next Saturday June 28. SIPTU members will also join the Dublin Pride Parade on Saturday June 28. Email “Liberty Hall lights up for Dublin's Pride Festival ”. 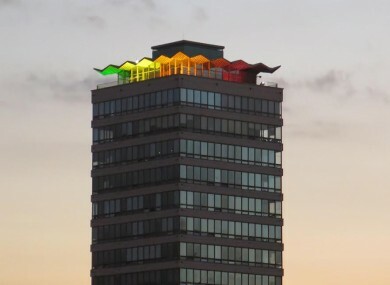 Feedback on “Liberty Hall lights up for Dublin's Pride Festival ”.